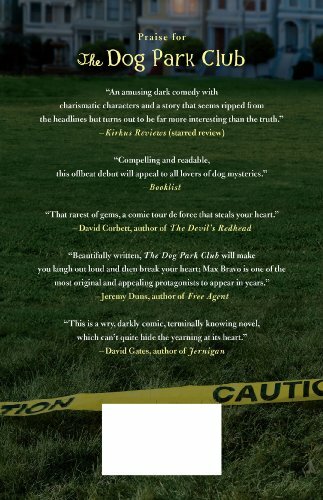 Opera singer extraordinaire Max Bravo is back in this sequel to THE DOG PARK CLUB that explores both mysterious disappearances and misleading appearances. Max Bravo is ready for some rest and relaxation. But when an old friend takes a leap off the Golden Gate Bridge, Max realizes that rest and relaxation simply aren't in the cards. The jumper, Frank Kelly, was a failed writer and an accomplished hothead. Max acquires Frank's journal, and is soon following the dead man through a foggy landscape of artistic manias and romantic intrigues. Along the way, he encounters a motley crew of crackpots, bohemians, and wily ghosts that refuse to be buried in San Francisco's Barbary Coast past. Fans of quirky, literary mysteries will love this second dose of Max Bravo and his outrageous adventures.